As you read in my previous post, I’ve made the switch to Windows 10 from OSX and was running into some issue with my Wifi. Now, a few weeks later I switched my cable mouse to a new nice Bluetooth mouse, the Logitech MX Master 2S. Although it is a really nice mouse to work with, with long battery life, I was running into an issue where the mouse would stutter or respond very slow when I left it alone for maybe just 5 seconds or longer. Moving the mouse, typing something with both hands and grabbing the mouse again, would give no response until I moved it for like 1-2sec. Very annoying. It looked as if the mouse fell a sleep all the time. Searched the Logitech forums to no avail and finally found a post that explained this might be the bluetooth / wifi hardware that slips into a power nap. 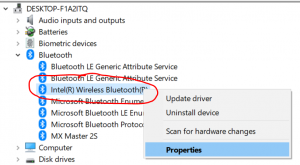 “Fix for stuttering, lag in Bluetooth mouse on Windows 10“. Unfortunately my wifi device didn’t have the option, so I started searching to other places where there would be an option to disable some form of power management on the bluetooth device. 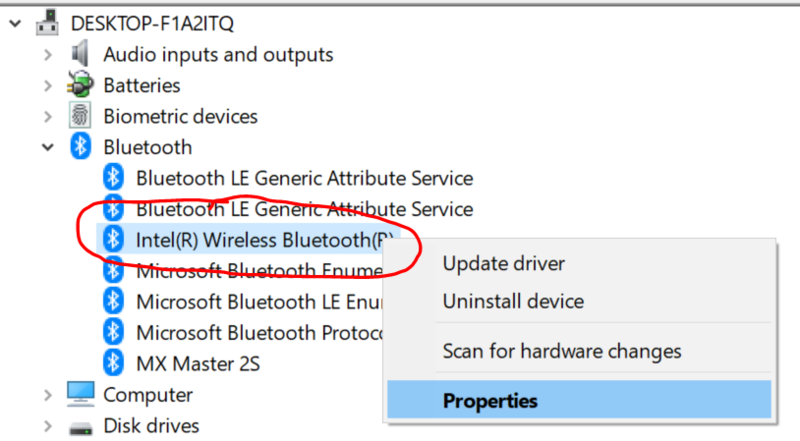 At last I found the solution in the device manager under bluetooth device and then the “Intel Wireless Bluetooth” device, not the MX Master S2 device. Then go to properties, find the Power Management tab and disable it. That immediately solved it for me. Windows 10 bluetooth, mouse, stutter, windows 10. permalink.